Half a wheelbarrow or two full pallets? Find out exactly how much you need for your project. Mulch, gravel, soil and other products sold by the cubic yard. A typical mulch application is 3" deep. If you are just topping off your beds, then you could try a 1" to 2" layer. 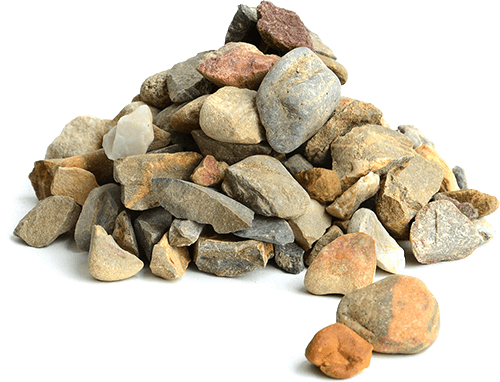 A typical gravel layer is around 2", but keep in mind that if you are using bigger sized stones that they will be hard or impossible to spread at that thickness. For Example: Egg Rock, River Pebbles, and River Slicks should be calculated at a 3" thickness. Creek Slicks and Mega Slicks should be calculated at a 5-6" thickness. For top dressing and thin applications. Regular application is approximately 1/3"
Thicker application is approximately 2/3"
If it's your first application, do a regular application instead of thick. 1 cubic yard of sand covers approx. 200 square feet. For deeper applications, use the Bulk calculator above. For Flagstone, Fieldstone, Thin Veneer and Cultured Stone sold by the ton. Thin flagstone should only be used for applications over an existing concrete slab or veenered (laid flat or vertical) on a wall. You might not need edging if the top surface of your patio is at grade level and not raised. Crusher run is calculated as an uncompacted base, it's always smart to get a little excess to make sure you don't run short. All cement is sold by the bag. Depending on wall size, you might need an extra block below grade for footer. Only use pins if your using a Versa Lok system. Over 3 ft walls could require Geo-Grid reinforcement. Let us know if you need help calculating geo grid. The rise is how tall from top to bottom the stairs will climb. The run is the total distance from beginning to end of the stair case. Stair Tread thicknesses vary and can vary an inch or so throughout a pallet. As long as you are averaging out around the thickness needed, you'll be golden.